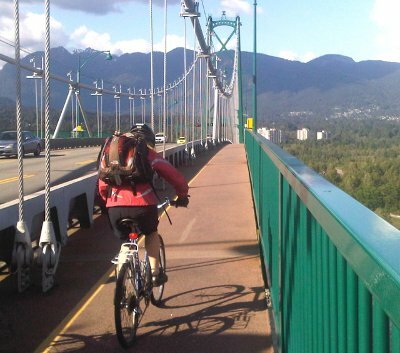 The North Shore committee of HUB: Your Cycling Connection is dedicated to enhancing the safety and feasibility of using bicycles for transportation in North Vancouver, West Vancouver, Bowen Island and Lions Bay. This includes commuting to work and school, shopping, personal trips and any other short to medium length journeys. HUB North Shore meets at 6:30pm on the second Thursday of every month at the North Vancouver City Library in the 2nd floor meeting room. For the next meeting date and agenda, and for information on past meetings, please refer to the Meetings page. Participating in HUB on the North Shore is as simple as joining us at our monthly Meetings, contributing to our Email List (Free to join! ), volunteering at Bike to Work Week stations, or joining us at various community events. Most importantly, get on your bike and ride! If you have any questions or comments that are not answered on this site please send email to northshore@bikehub.ca. The North Shore Committee's communication with local governments, the province and other organizations is archived here. Read about HUB North Shore on our In the News page. The pdf version of the August 2018 edition is available for download on the HUB website . Hard copies of the pocket folding map are available at Libraries, Municipal Halls and at our Meetings & Events. Our Routes and Short Cuts page lists a few routes commonly used by to get around the North Shore. Our Hot Spots page lists specific locations on the North Shore that need attention for advocacy. If you're a rider who has recently encounter a Hot Spot please see if it is listed and, if not, submit it for inclusion in the list. Are you new to riding the streets of the North Shore? Browse through our Frequently Asked Questions page for information and tips about riding in our beautiful area. The development of policy and infrastructure for cycling on the North Shore usually involves the cooperation of several governments and agencies. For more information please refer to our Governments and Other Official Entities page. How did municipal politicians vote about cycling? Check out the voting record of the councils of North Vancouver (City and District) and West Vancouver. The following list provides links to research and data on the economic impact of cycling, especially on retail. For business resources and support in Metro Vancouver, please visit HUB's Bike Friendly Business Program. Here you will find links to various online resources that contain useful information about cycling rules, etiquette and the development of improved cycling facilities. This wiki is read-only to all users. To modify pages, please request an account by emailing ellie@bikehub.ca. This page was last modified on 24 April 2019, at 18:32.